304 pages, 8.5" x 11"
OPENING FENWAY PARK WITH STYLE: The 1912 World Champion Red Sox is the collaborative work of 27 members of the Society for American Baseball Research (SABR). This book, which contains over 300 period photographs and illustrations, has as its core the individual biographies of every player on the team, even including Douglass Smith—who appeared in just one game. There are also biographies of owner John I. Taylor and American League founder Ban Johnson. The book also contains a detailed timeline of the full calendar year, with essays on the construction of brand-new Fenway Park and its first renovation, as the team (which won the pennant by 14 games) prepared for Fenway’s first World Series. The 1912 World Series remains one of the most exciting ones in baseball history, extending to eight games because of a 14-inning tie game in Game Two. Game Eight itself saw the Giants score a tie-breaking run to take a lead in the top of the 10th inning, only to see Boston come back with two in the bottom of the 10th and win at home. Other articles in the book reveal a fascinating spring training, which saw Sox players join the hunt for a murderer in Hot Springs, and look at life in Boston in 1912 — as well as how the newspapers and telegraph reported the games, in the days before radio and television and the internet. It may surprise some to learn of the thousands of people who crowded outside the downtown offices of newspapers so they could get batter-by-batter updates on the progress of the World Series games-in-progress. There are more than a dozen books celebrating the 100th anniversary of Fenway Park, but not one which is devoted to the 1912 season itself, providing the context for the then-new park which remains home to Boston baseball a century later. E-book: Click here to download your FREE copy of OPENING FENWAY PARK WITH STYLE from the SABR Store. Available in PDF, Kindle/MOBI and EPUB formats. 50% discount: Click here to get a 50% discount on the paperback edition of OPENING FENWAY PARK WITH STYLE from the SABR Store ($15.99 includes shipping/tax). 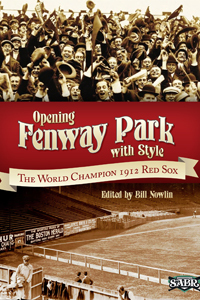 E-book: Click here to purchase OPENING FENWAY PARK WITH STYLE for $6.99 from the SABR Store. Available in PDF, Kindle/MOBI and EPUB formats. Paperback: Get the paperback edition of OPENING FENWAY PARK WITH STYLE from the SABR Store ($30.99 includes shipping/tax). For 40 years, SABR and its members have led the way in publishing the best baseball historical and statistical research. Our publications program is shifting to take advantage of new methods of publishing. Not only will we continue to publish new books like CAN HE PLAY? A Look At Baseball Scouts and Their Profession (released in December 2011) which showcase the best efforts of SABR's members, chapters and committees, but new technology makes it possible for us to bring out-of-print titles like RUN, RABBIT, RUN: The Hilarious and Mostly True Tales of Rabbit Maranville (released in February 2012) and GREAT HITTING PITCHERS (released in March 2012) back again. Books will be available in digital formats as well as paperbacks produced by "print on demand" (POD). To learn more about SABR Publications, contact Publications Editor Cecilia Tan at ctan@sabr.org. This page was last updated October 31, 2017 at 10:13 pm MST.